Anyone who wants to understand today’s news environment faces a challenge: How to discern the nuances of digital news habits when Americans’ attention spans are fractured, human memory is naturally limited and news comes at them every which way. To tackle this complex question, Pew Research Center, in association with the John S. and James L. Knight Foundation, took on the unusual task of staying in touch with more than 2,000 U.S. adults who get at least some news online over the course of a week. The study ran from Feb. 24 to March 1, 2016. 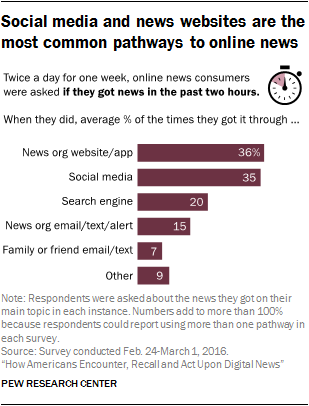 Respondents were asked twice a day whether they got news online within the past two hours and, if so, were asked about their experience with that news. This technique was used to improve the chances that respondents would be able to accurately recall their recent news interactions and allowed researchers to ask about sources and behaviors with a high level of detail. This amounted to up to 14 completed surveys per person for a total of 25,602 interviews – 13,086 of which included online news consumption. The study also sheds light on whether people are actually aware of the sources of news they consume – a question all the more relevant in light of the prevalence of fabricated news stories during the final weeks of the 2016 election. It reveals that when consumers click on a link to get to news, they can often recall the news source’s name. Individuals who said they followed a link to a news story were asked if they could write down the name of the news outlet they landed on. On average, they provided a name 56% of the time. But they were far more able to do so when that link came directly from a news organization – such as through an email or text alert from the news organization itself – than when it came from social media or an email or text from a friend. It was also the case that 10% of consumers, when asked to name the source of the news, wrote in “Facebook” as a specific news outlet. Another critical issue facing the industry is identifying which news experiences tend to inspire follow-up actions such as sharing, searching for more information or talking about it with others. This study suggests differences based on both the pathway used to get the news and the topic of news itself. Among the five pathways studied, news instances spurred by emails and texts from friends or family elicited the most activity; nearly three-quarters (73%) of these instances were acted upon in some way. That outpaced even social media and direct visits to a news organization’s website, where a follow-up action occurred in about half of news instances (53% and 47%, respectively). Overall, talking with someone offline, whether in person or over the phone, was the most common action taken with digital news. As for the topic of the news, community and health news spurred follow-up action about two-thirds of the time, while entertainment, sports and business news did so only about half the time. The type of follow-up action taken also varied with news topic. Stories about community affairs stand out for their social nature and were shared via social media at a far higher rate than any other topic. Science news, on the other hand, was bookmarked or saved for later or sent to someone via email or text at a higher rate than most other topics. Still, for all pathways and topics studied, speaking with someone offline about the news rises to the top. It is important to keep in mind that this is self-reported data, and activities even as recent as the last two hours can be hard for some people to recall. At the same time, though, while a repeated survey like this can make people more aware of their online activities, little evidence of this emerged. This unique approach provides a deeper and more tangible window into how Americans learn about current events in the digital age, and speaks to some of the challenges news organizations have in establishing a relationship with digital audiences. Just as individuals tend to favor one digital pathway over others, certain topics in the news are more likely to be learned about through one method over another. Business and finance news, for example, is more likely to be accessed by going directly to a news website. About half of business and finance news instances (53%) occurred through an individual going directly to a news website or app, compared with just 12% that came through social media. Community news, on the other hand, was much more likely to be discovered through social media (53%) than on a news website (22%). Social media, search engines and friends’ emails and texts all succeed in engaging news consumers within the bounds of each venue. About a quarter (23%) of the instances in which news came through a search engine resulted in searches for additional information, a higher share than any other pathway. Similarly, 14% of news instances from friends or family led to sending news via email or text, compared with 5% or less of the instances from any other pathway. And when people got news through social media, they went on to re-share that news on social media one out of four times. 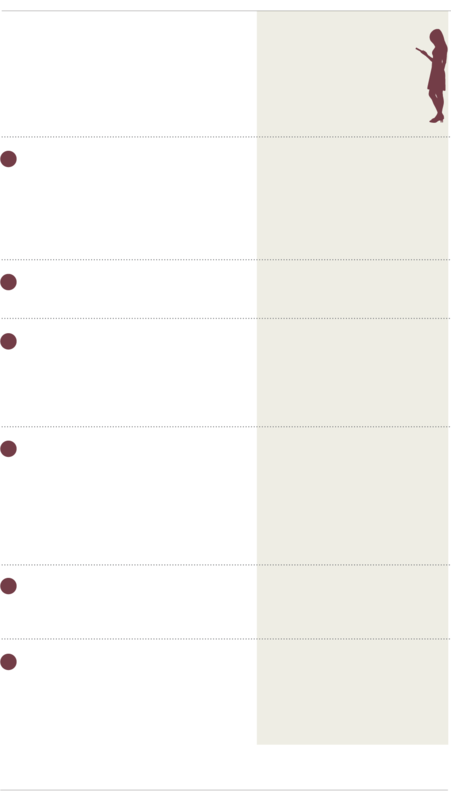 On the other hand, no single digital action stands out for news that came from a direct connection with a news organization. Younger and older online news consumers follow news links at the same rate, but younger adults are less likely to remember the source. When 18- to 29-year-old online news consumers clicked on news links, they remembered the source about half the time (47%), at least 10 percentage points less than their elders (57% for 30- to 49-year-olds and 61% for those 50 and older). And these younger online news consumers got their news through social media 47% of the time on average, about double the rate of those 50 and older (23%), and about on par with those ages 30 to 49 (42%). Those 50 and older, on the other hand, stand out for their heavier reliance on news organizations’ emails, texts and alerts. 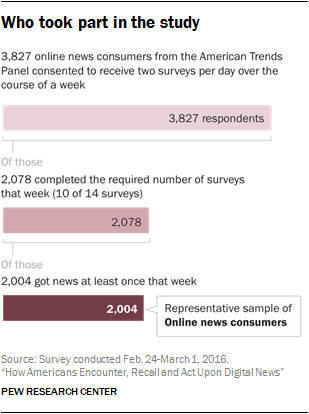 Over the course of one week (Feb. 24 to March 1, 2016), a nationally representative sample of online news consumers received two short surveys per day (14 total) asking about the news they got online, if any, in the past two hours. The respondent pool comes from a survey conducted Jan. 12-Feb. 8, 2016, among 4,654 U.S. adults ages 18 and older who are members of Pew Research Center’s nationally representative American Trends Panel. In this February survey, those who indicated that they get news digitally (on a desktop or laptop computer or mobile device) were asked to participate in a weeklong study of their online news consumption. 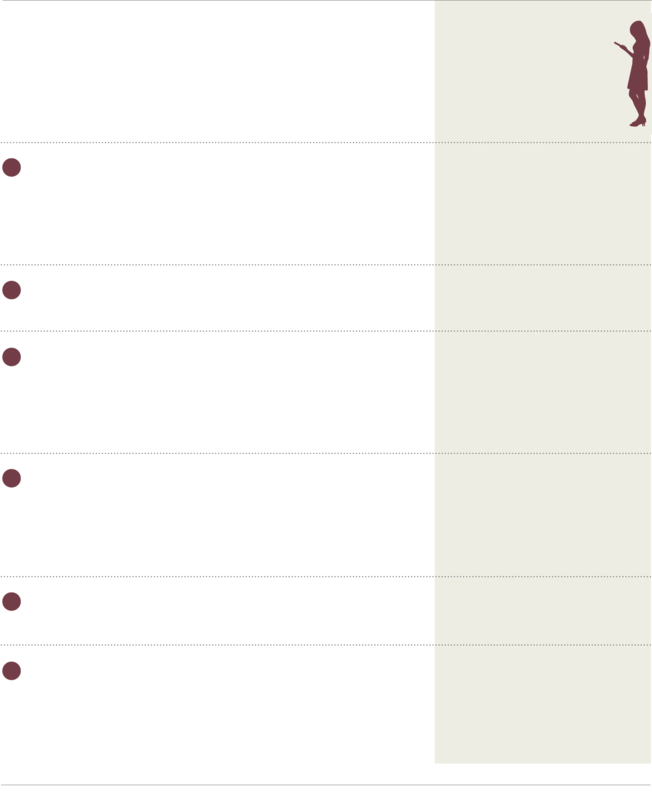 Of these individuals, 3,827 agreed to participate. A total of 2,078 respondents completed at least 10 of the 14 mini-surveys during the week, of which 2,004 said that they got news online in at least one survey. These respondents are representative of online news consumers in a given week. Online news consumer level: Average behavior of the 2,004 online news consumers surveyed over the course of the week. For example, the report looks at how often, on average, consumers got news by going directly to a news website versus getting it through social media. Instance level: The characteristics of the 13,086 total news instances that occurred during the week studied. For example, the report looks at whether news accessed through social media is more likely to be acted upon than news from a news organization’s website. The report is divided accordingly into these two distinct parts, and the relevant icon – from the two above – appears at the start of each section to help readers keep the analytical frame in mind.